In 1946, the J.L. Hudson Company, a Detroit-based department store chain, commissioned ten artists to convey every phase of Michigan life—natural and urban, agricultural and industrial—to portray to the people of Michigan the unique beauty of living in their great state. These artists were presented with the phrase that emblazons the Michigan seal: “Si Quaeris Peninsulum Amoenam Circumspice,” or for those of us who do not speak Latin, “If you seek a pleasant peninsula, look about you.” This is exactly what these artists did, Blanch, as one of the selected painters, included. They looked about them and they let what they saw and experienced in Michigan pour out of them onto the canvas. At the time when these works were being commissioned, thousands of vacationers flocked to Michigan to enjoy the abundant fishing and plentiful water sports that this peninsula and its numerous lakes have to offer. Blanch was among these fishing enthusiasts, saying, “In choosing the painting subjects for this project, I considered recreation, which included hunting and fishing, the most exciting thing to me.” Such excitement can be seen in Blanch’s piece aptly named, The Hunters. In this woodland scene, two men seem to be rounding out a successful day hunting as they cook a meal over their campfire. Their tent is perched open and their makeshift drying rack suspends a deer and a bear, two unlucky animals that these skilled hunters happened upon. Trees stand in the background at varied angles while clouds hover overhead, creating the ideal atmosphere for our two hunters. Next week, Cranbrook Art Museum mounts Designing Summer: Objects of Escape.The exhibition—which exclusively features works by Michigan designers and makers—examines how summertime in the Great Lakes State is embodied through objects of the past and present. 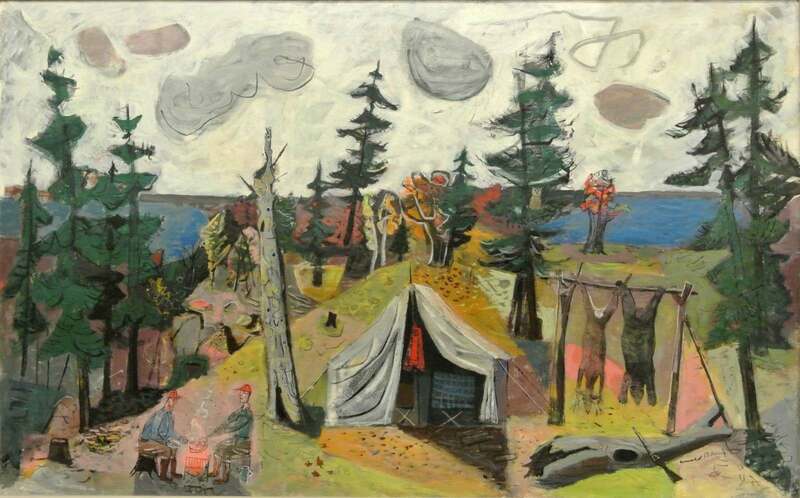 With its campfire and tent, giant pines, and glimmering lake waterline in the distance, The Hunters captures through imagery the same summertime natural romanticism that is represented by many of the works in the show. Come see for yourself—Designing Summer opens Saturday, June 20! References: Davies, Florence. Michigan on Canvas: The J.L. Hudson Company Collection. N.p. : n.p., 1948.